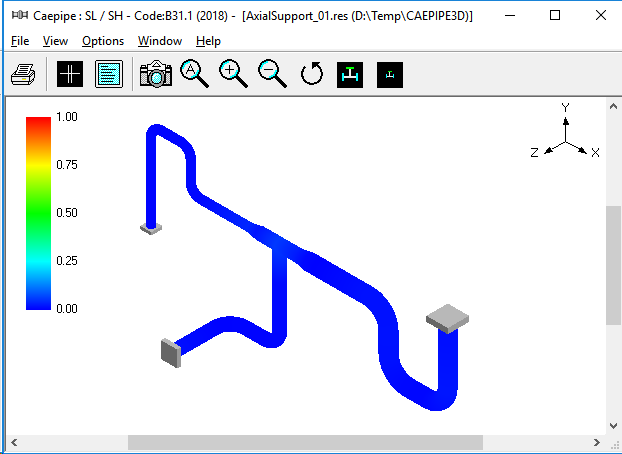 Model the piping system in CAEPIPE (either directly inside CAEPIPE, or by using one of SST’s data translators to import the piping model) and follow the steps shown in the CAEPIPE Tutorial to learn the basics of operating CAEPIPE to create and analyze a model and review its results. Once all the data is in, Analyze. Now, review Results. 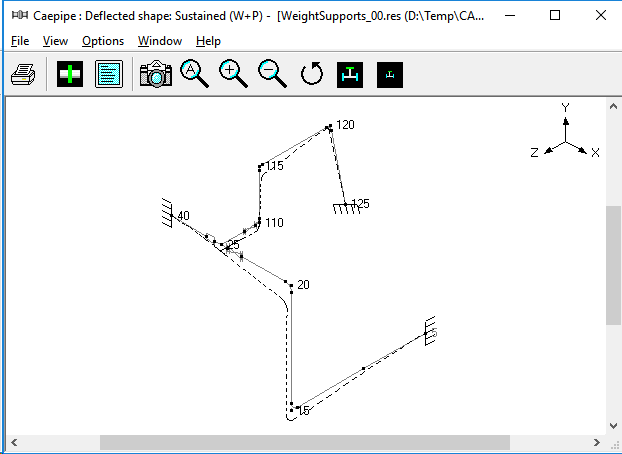 Review first stress contour plot for thermal stresses. The plot is color-coded such that "blue" region denotes areas with the least stress ratios (where stress ratio equals to actual computed stress divided by allowable thermal stress), "green" region with higher stress ratios, "yellow" region with even higher stress ratios, and "red" region with the highest stress ratios. Intermediate areas between these distinct colors will be of "bluish-green", "greenish-yellow" and "orange" colors. 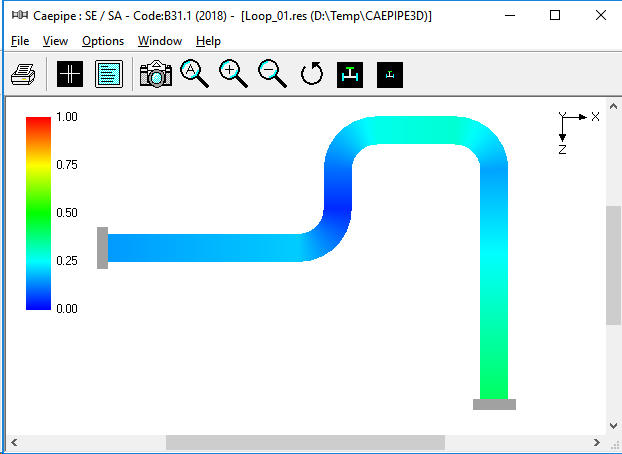 Since thermal stresses generated are directly dependent on how "flexible" the layout is, it may be necessary to make the layout as "flexible" as possible (by including bends, offsets, loops etc.) to reduce thermal stresses. 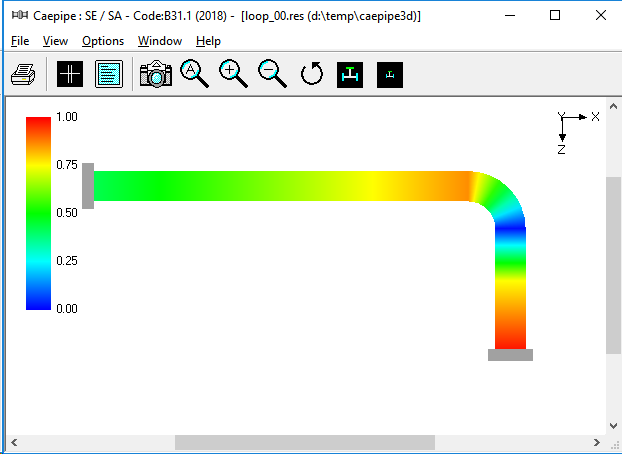 So, the goal is to arrive at a "flexible" layout for which thermal stress ratios remain within "blue" to "yellow" range and not get into "orange" and "red" zones. For a more "flexible" layout, even "yellow" zone may be avoided. In case thermal stress ratios exceed "yellow" zone (i.e., "orange" and "red" zones appear in one or more areas of the piping system), it is important to study the deformed shape for "thermal" load case in order to understand how the piping deforms for "pure thermal" load (where only temperature change is considered). 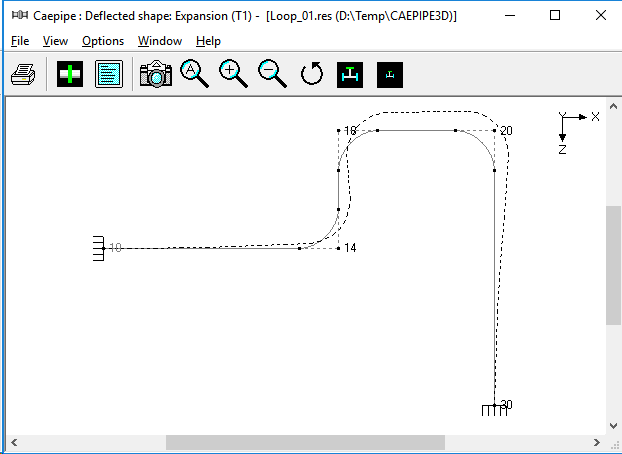 By studying such deformed shape, it is possible to arrive at a layout with appropriate bends, offsets and loops and/or with appropriately located axial restraints/intermediate anchors such that thermal stress ratios do not exceed "yellow" zone. 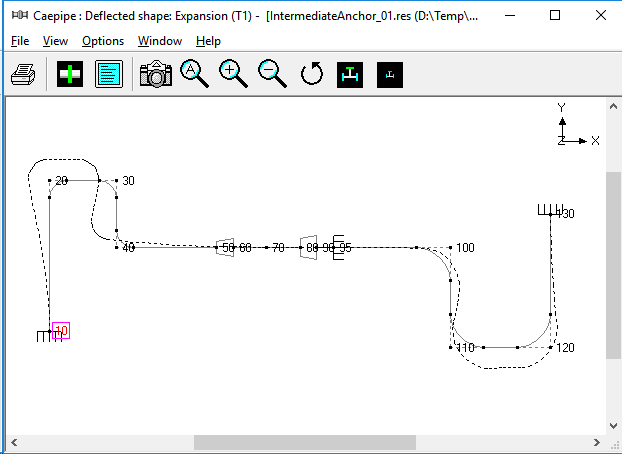 This process may require several iterations on layout and/or locations for axial restraints/intermediate anchors. 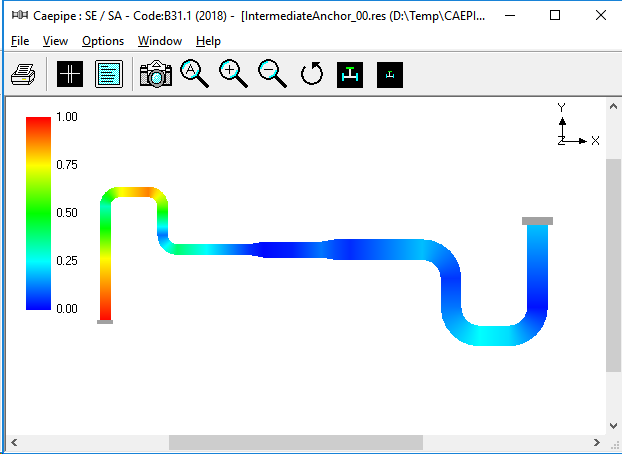 After finalizing piping layout under Steps 2 and 3 for thermal loading, the next task is to support the system vertically to carry its own deadweight under operating condition. In this connection, first review stress contour plot shown in color codes from "blue" to "red" (as in Step 2 above) for sustained stress ratios generated by deadweight and pressure for the system without any vertical supports (excepting those provided by equipment nozzles and intermediate anchors introduced in Step 3 above). The goal is to arrive at a vertical support scheme consisting of (a) resting steel supports, (b) rod hangers, (c) variable spring hangers and (d) constant support hangers, at appropriate locations (where such pipe supports can be attached to adjacent concrete/steel structures, platforms etc.) so that stress contour plot for sustained stress ratios avoids "orange" and "red" zones and remains within "blue to yellow" range. 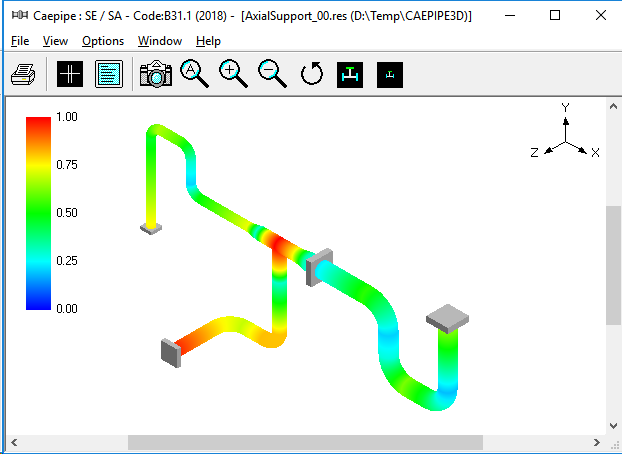 In case sustained stresses exceed "yellow" zone in one or more areas of the piping system, study the deformed shape provided by CAEPIPE for sustained load case in order to understand how the piping responds to its own deadweight. Next, identify pipe locations where the pipe can be vertically supported by the support types listed under Step 4 above. 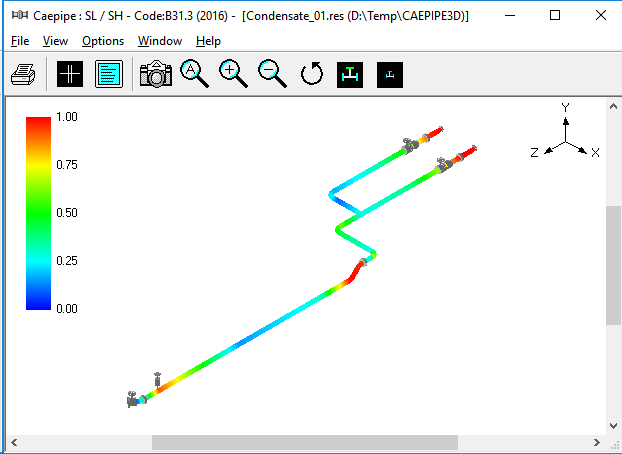 Based on this input, vertically support the piping such that sustained stresses do not exceed "yellow" zone. This step may require a number of analysis iterations with several different locations for weight supports. In case resting steel supports are selected to provide vertical support for piping under sustained load, it is to be made sure that piping continues to rest on such steel supports even during operating condition (= weight + pressure + thermal) and does not lift off from these supports. If pipe lifts up at any of these resting supports during operating condition, then that support does not carry any pipe weight and hence will not serve its purpose. Similarly, at rod hanger locations, the tendency of piping should be to deform downward for operating load case, so that the rod hangers carry the pipe weight under tension. On the other hand, if pipe lifts up at any of the rod hangers, then that rod hanger goes into compression thereby not carrying the weight of the piping during operating condition. Whether the pipe weight is being carried during operation by resting steel supports and/or rod hangers (both types are mathematically modeled as one-way vertical Limit Stops in CAEPIPE) or whether the pipe lifts up at those support locations is shown in the report titled "Status of Limit Stops – Operating Load". The goal is to make sure the status is shown as "Reached" at all vertical Limit Stops for Operating Load case. 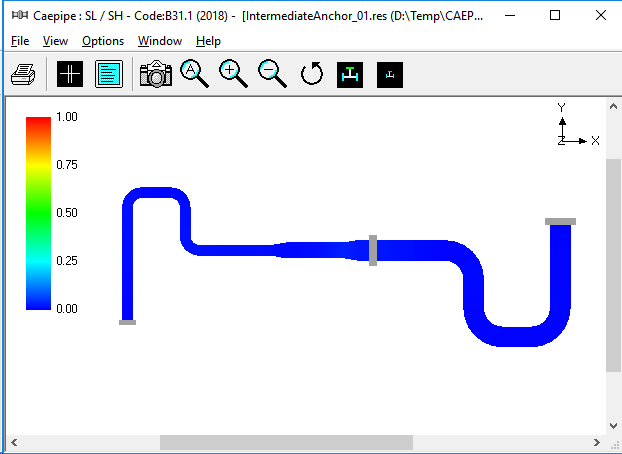 After arriving at a final layout with an acceptable pipe support scheme under Steps 2 to 5 for thermal and sustained loads, the next task is to protect piping against large horizontal and vertical movements that could occur due to static seismic "g" load. This can be accomplished by replacing some of the weight supports with "integral 2-way vertical and lateral restraints". In this regard, review stress contour plot for occasional stresses generated by deadweight, pressure and static seismic "g" load shown in color codes from "blue" to "red" (as in Step 2 above). The goal is to replace some of the weight supports (for example, resting supports) located in the "yellow" to "red" zones with "integral 2-way vertical and lateral supports", so that stress contour plot for occasional stresses avoids "orange" and "red" zones and remains within "blue to yellow" range. In case occasional stresses exceed "yellow" zone in one or more areas of the piping system, study the deformed shape provided by CAEPIPE for occasional load case in order to understand how the piping responds to static seismic "g" load. 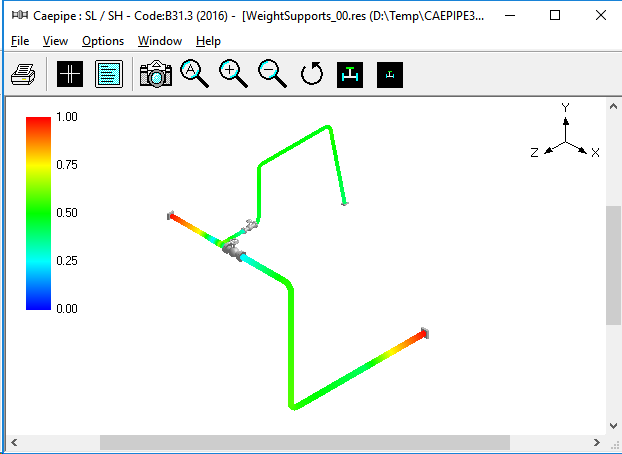 Next, identify those weight support locations (for example, resting supports) in the "yellow" to "red" zones where the pipe can also be laterally supported and replace those weight supports with "integral 2-way vertical and lateral restraints", such that occasional stresses do not exceed "yellow" zone. 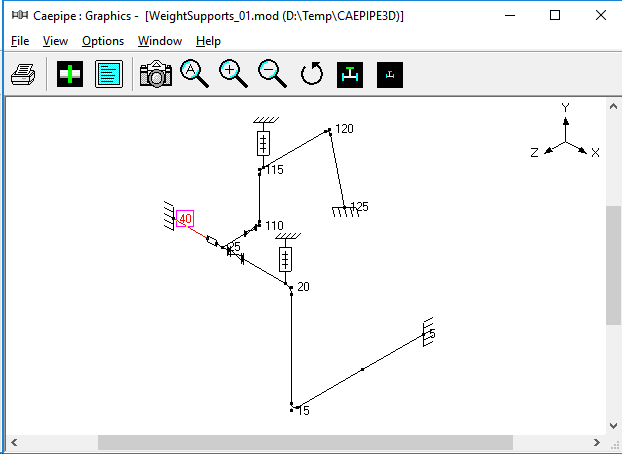 This step may require a number of analysis iterations with several different locations for "integral 2-way vertical and lateral restraints". After locating relevant supports (a) to minimize thermal stresses, (b) to carry weight of the piping during operation, and (c) to withstand static seismic "g" load, the calculated loads at nozzles/anchors in the Support Load Summary need to be checked. If the calculated loads at nozzles/anchors exceed the corresponding Allowable Loads, by studying the deformed shapes provided by CAEPIPE for different load cases, it is possible to further modify the layout and/or support scheme such that the calculated loads at nozzles/anchors do not exceed the Allowable Loads. As a minimum, the above said Nozzle Load compliance should be carried out for Operating Load case. Any such changes made to the layout and/or support scheme at this stage (i.e., at Step 8) should not adversely affect the stresses for thermal, sustained and occasional load cases (i.e. all the 3 stress contour plots should continue to avoid "orange" and "red" zones and remain within "blue to yellow" range). This process may require several iterations on layout and/or support scheme. DATA: An 8" NB Schedule 80 pipe (see Fig. 1A) connects two equipment at nodes 10 and 30 with an offset of 4’ (i.e., equal to distance between nodes 20 and 30). The pipe, made of A53 Grade A carbon steel, is heated to 300° F.
This problem illustrates the use of expansion loops to reduce thermal stresses. 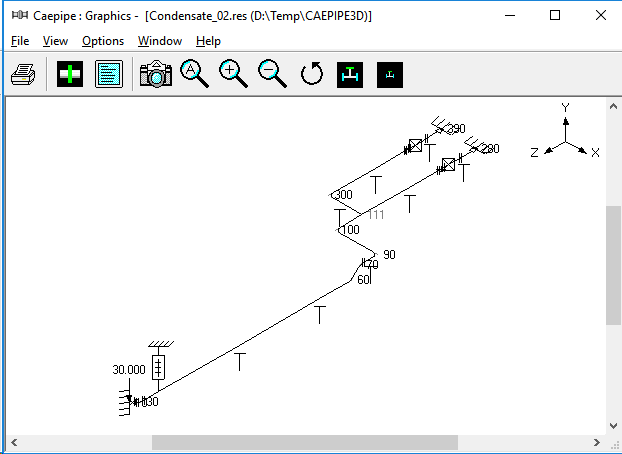 After modeling this layout in CAEPIPE, upon analysis, you will find that the pipe between nodes 10 and 20 grows thermally to the right towards node 20, while pipe between nodes 30 and 20 grows up towards node 20, as illustrated in Fig. 1B. This thermal deformation generates large thermal stresses (orange and red zones) in the bend at node 20 and at anchor node 30, as shown in Fig. 1C. The reds illustrate that the expansion stress is over the allowables, and fails code compliance. This layout will have to be rerouted. Let us try the rerouting as shown in Fig.1D. Fig. 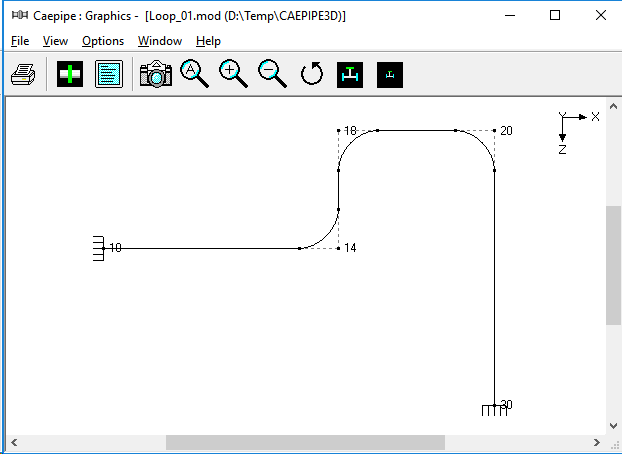 1D shows a revised layout with a loop, introducing two additional bends at nodes 14 and 18, thereby making the layout more flexible. 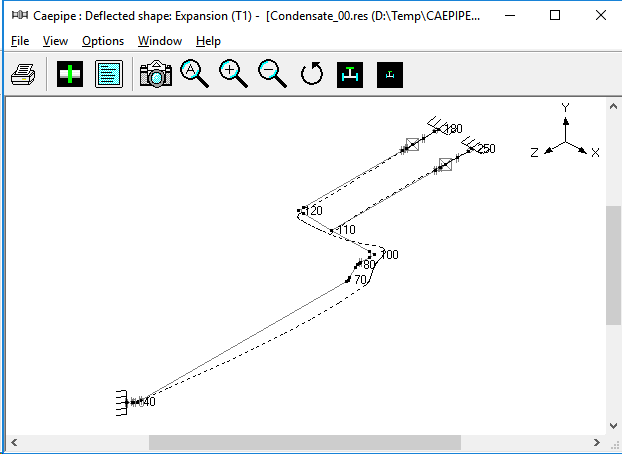 So, thermal growth of X-directional pipes between nodes 10 and 14 and then between 18 and 20 as well as the growth of Z-directional pipe between nodes 30 and 20 are absorbed by the three bends at nodes 14, 18 and 20. The corresponding stress contour plots for thermal and sustained load cases are shown in Fig.1E and Fig. 1F, confirming code compliance. Since the loop between nodes 10 and 40 is much more flexible (4" pipe) than the loop between nodes 100 and 130 (8" pipe), the straight pipe between nodes 40 and 100 will thermally grow mostly towards the 4" loop, as shown in Fig. 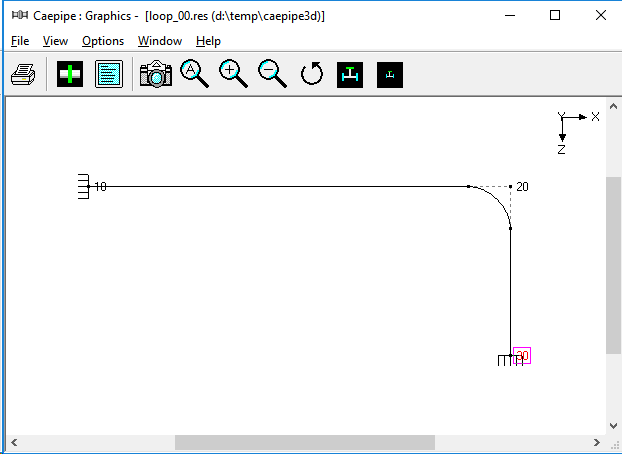 2B, straining the pipe between nodes 10 and 40. This, in turn, produces large thermal stresses (i.e., orange and red zones) in the 4" loop and at anchor node 10, as observed in Fig. 2C. In other words, the thermal growth of pipe between nodes 40 and 100 is mostly absorbed by the 4" loop and very little by the 8" loop, defeating the very purpose of the 8" loop. In order to alleviate thermal stresses in the 4" loop, introduce an intermediate anchor at node 95 immediately after the second reducer, so that the thermal growth of straight pipe from node 95 to node 100 is absorbed by the 8" loop, while the thermal expansion of straight pipe between nodes 40 and 95 is absorbed by the 4" loop, thereby making both loops achieve their intended purpose. The corresponding thermal displacement and thermal stress contour plots are given in Fig. 2D and Fig. 2E respectively. Fig. 2F confirms that the present configuration with only two equipment nozzles at nodes 10 and 130 and an intermediate anchor at node 95 safely meets the code stress requirement for sustained load. This problem shows how axial restraints (i.e., pipe supports that prevent movement along a pipe’s axis) can be effectively used to direct thermal growth towards expansion loops and split thermal growth in a line such that the two piping portions grow in opposite directions. Fig. 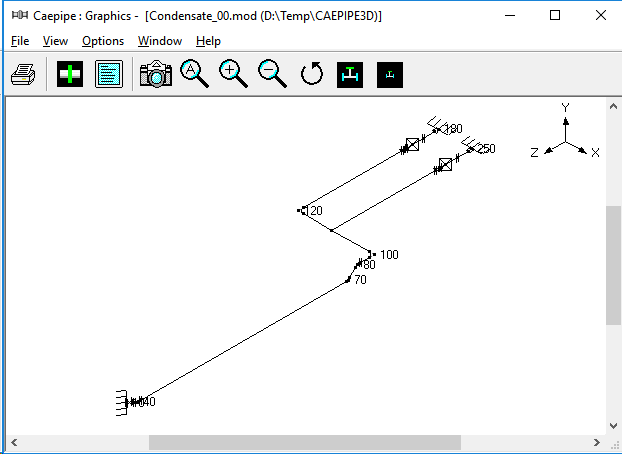 3A shows the same problem as in Example 2 but with a 6" NB branch line added at the welding tee at node 70 (i.e., from node 70 to node 240). The deformed geometry due to the thermal load (Fig. 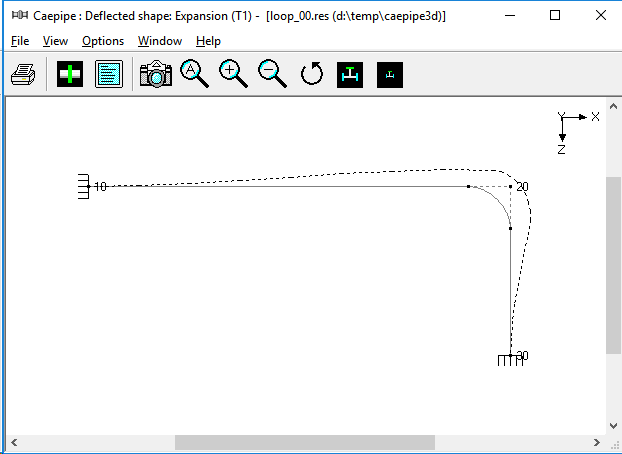 3B), shows that the tee at node 70 does not move up in +Y-direction. The intermediate anchor at node 95 restrains the vertical riser (between nodes 220 and 70) from thermally growing upward towards node 70. As a result, this riser grows downward producing large bending moments and stresses at and around equipment nozzle at node 240. Since the intermediate anchor effectively restrains upward growth of this vertical riser node 70, we see large localized thermal stress at the welding tee. See thermal stress contour plot shown in Fig. 3C. Fig. 3D shows the same piping system with one axial restraint at 95 (replacing the intermediate anchor at node 95) and another at node 210 — the one at node 95 splits and directs thermal growth towards the 4" and 8" loops and permits the horizontal line to move up in +Y-direction at node 70; the second one at node 210 splits the thermal growth of the vertical riser (between nodes 220 and 70). The resulting deformed geometry plot in Fig. 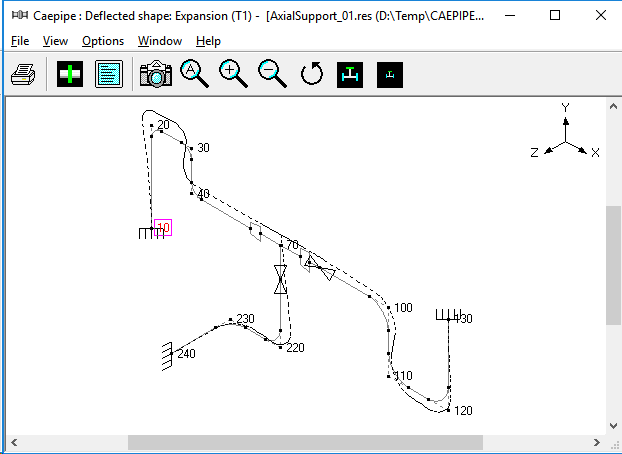 3E shows a more flexible system, which produces smaller forces and moments, and hence stresses at the equipment nozzle node 240 and welding tee node 70. Figures 3F and 3G show the thermal and sustained stress contour plots (in this case sustained stress is due to only deadweight as pressure is zero), confirming a code-compliant system for both load cases. This example illustrates how to select and locate vertical supports to carry piping deadweight in the operating condition. Fig. 4A shows a practical problem with 10" NB Standard schedule pipe from equipment nozzle at node 5 up to the reducer at node 30, 8" NB Standard schedule pipe from this reducer to the pump nozzle at node 40, and a 6" NB Standard schedule branch line from the welding tee at node 25 to the equipment nozzle at node 125. The thermal stress contour plot given in Fig. 4B confirms that the piping system is highly flexible and hence meets the code requirement for thermal load. iv. a small portion of the vertical riser from node 15 to node 20. The deformation response for deadweight, in turn, generates large forces and moments and hence large sustained stresses at nozzle nodes 5 and 40 as shown in Fig. 4D for sustained stress contour plot. Fig. 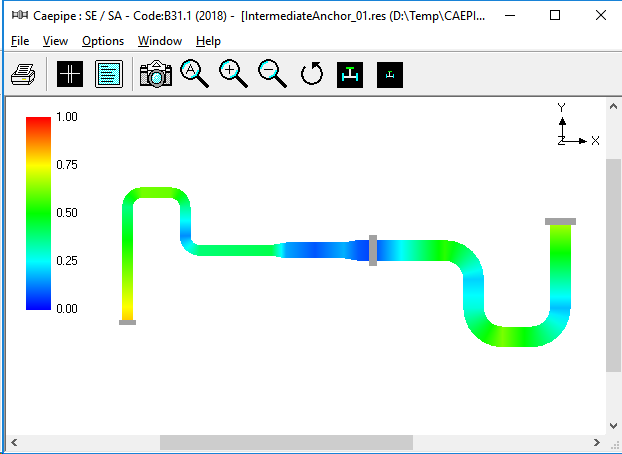 4E shows the same layout with variable spring hangers at the bends at nodes 20 and 115, which carry piping deadweight and provide negligible restraint to thermal movement from cold to hot condition and vice versa. The thermal and sustained stress contour plots given in Fig. 4F and Fig. 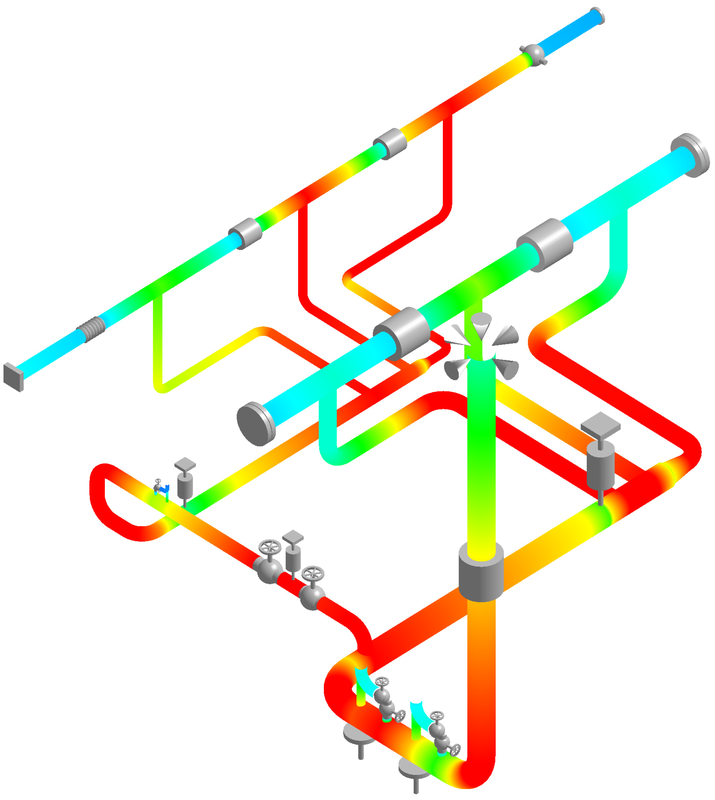 4G confirm that the piping system with hangers is code-complaint for both sustained and thermal load cases. This practical example illustrates how to place resting steel supports to carry the system weight with operating fluid and modify the layout in order to re-direct thermal growth to comply with code stress requirements. Fig. 5A shows the initial layout where condensate from a tank (node 10) is extracted by the pump suction lines. When one pump is operating, the other one is on standby. From Fig. 5B, we see that the pipeline from nodes 10 to 100 grows thermally in the –Z direction (towards the pumps), whereas the two pump suction lines, one from nodes 120 to 180 and the other from nodes 110 to 250, grows in the opposite direction towards the tank (+Z direction). So, the straight pipe between nodes 100 and 120 (with a welding tee at node 110) experiences two opposing deflection patterns -the pipe portion between nodes 110 and 120 is being deflected in the +Z direction like a rigid stick while the portion from nodes 10 to 100 deflects in the -Z direction. This causes the pipe between nodes 100 and 110 to bend at the tee producing high strains and hence thermal stresses locally at the tee node 110, as shown in Fig. 5C. In order to reduce these thermal stresses at node 110, we cut the straight pipe between nodes 100 and 120 into two parts – one part is the pipe from nodes 100 to 110 and the second part is from nodes 111 to 410 to 300. We then shift the second part downstream towards the two pumps, resulting in the modified layout shown in Fig. 5D. 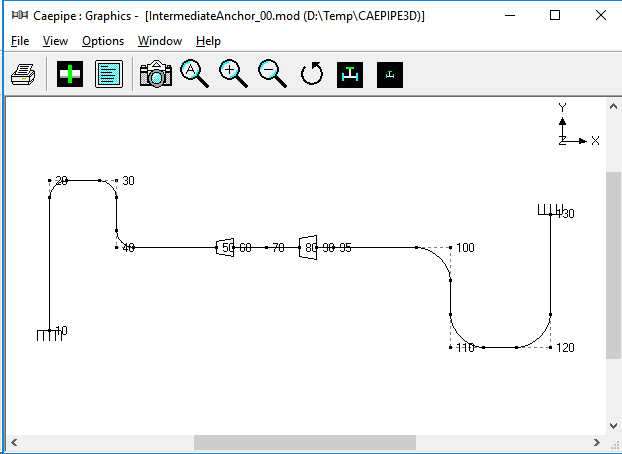 This shift of pipe downstream does not adversely increase the pressure drop between the tank at node 10 and the class=""umps at nodes 180 and 250. From the thermal deformation plot for this revised layout shown in Fig. 5E, we can see that the two pump suction lines from the suction nozzles to the welding tee at node 111 have almost equal thermal growth in the +Z direction. The branch pipe between nodes 111 and 300 acts as a rigid stick resulting in lower thermal stresses in that branch pipe as seen in Fig. 5F. 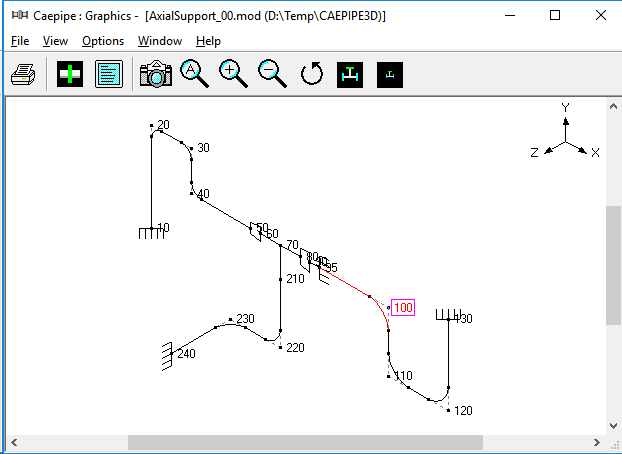 In addition, we see that the two pump suction lines make the bend node 100 grow thermally in the +Z direction, whereas the pipe from the tank node 10 to the bend node 90 grows in the –Z direction. These opposing deflections rotate the interconnecting pipe between nodes 90 and 100 like a (horizontal) "see-saw" in the horizontal XZ plane, resulting in lower thermal stresses in this region, as observed in Fig. 5F. Although the thermal stress criterion has been met, the weight stresses exceed the sustained stress allowables, as illustrated by many red and orange areas in the sustained stress contour plot given in Fig 5G. This is because there are no vertical supports (excluding the three nozzles and a variable spring hanger at node 52) to carry the weight of the system. Vertical resting supports are therefore introduced as shown in Fig. 5H. The recalculated sustained stress (i.e., weight + pressure) contour plot (with most areas in blue) shown in Fig. 5I are now well below the allowable stress values, and hence code-compliant. This concludes our tutorial on the basics of pipe stress analysis. We hope you feel confident now in "playing" with CAEPIPE by creating simple models and conducting several "what-if" studies on them, as alluded to in the examples above. If you have questions, please feel free to send them to us (support@sstusa.com). If you have not downloaded the free pipe stress analysis software, visit www.sstusa.com.